CI is a leading software manufacturer of IVR, CTI, Call Back, Outbound, Messaging, IP Phone applications and mobility solutions for the contact center. Founded in 1979, CI is focused on delivering solutions for mid to large enterprise clients that reduce costs, increase profitability and enhance overall customer satisfaction. With thousands of delighted clients, CI offers complete end to end solutions that can be purchased through our distributor or reseller network. 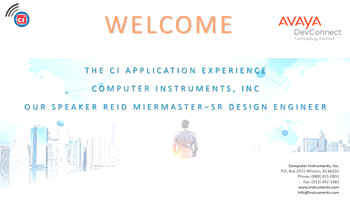 CI is headquartered in Mission, KS and is recognized worldwide for innovative business applications and solutions, exceptional service and support. Key to CI's continued success is a culture of "integrity first and foremost" making it possible to maintain successful, long-standing relationships with both partners and customers alike. CI's IVR platform is widely known for creating "rapidly deployed" customer call flow experiences that are customizable and scalable. CI's portfolio of IVR platforms have the flexibility to support the unique business and service requirements for any industry. CI's featured platform, eONE, is the product of over 35 years of knowledge and experience; all in a cost effective shrink-wrapped solution. eONE combines the power of IVR functions with Computer Telephony Integration (CTI), Web and Data integration, complex rules-based decision making, Unified Messaging, as well as custom integration with other customer applications. eONE's integration with Avaya equipment allows our software to scale very easily to meet the needs of your customer, and allows eONE to take full advantage of your customer's phone system features. In addition to our custom applications in the eONE platform, CI provides application development for the Avaya Voice Portal and custom applications for the Avaya IP Phones. Call us to find out what is possible, from the simple to the robust! Calling an automated line to check your balance and pay your bill by phone. Receiving an automated call to remind you of an upcoming appointment. Taking a post call agent survey. Entering a zip code to find the nearest store location. "Your call may be recorded for quality assurance." "At the tone, please speak the first and last name of the party you would like to reach." Being greeted by name when your call reaches an agent.